We’d love your help. Let us know what’s wrong with this preview of Haunted by Shirleen Davies. Not that she’d ever accept them. Tucker “Ghost” Robertson makes the most of his life as vice president of an undercover motorcycle club. Training hard, achieving mission goals, and spending his nights with whichever woman strikes his fancy isn’t a hardship and he sees no reaso No regrets. No apologies. Tucker “Ghost” Robertson makes the most of his life as vice president of an undercover motorcycle club. Training hard, achieving mission goals, and spending his nights with whichever woman strikes his fancy isn’t a hardship and he sees no reason to change it. Not even after turning his back on the only woman to breach his defenses since tragedy altered his life many years before. Daniella Sullivan has worked hard to become a member of her father’s exclusive training center for military and law enforcement. After an unanticipated breakup, then a short, but heart-shattering affair with an outlaw biker, she’s ready to focus on nothing except helping mold another class of elite warriors. Recuperating from a potential career-ending attack, Ghost has one last chance to get his numbers up or the admiral will relieve him from combat duty. It’s a fate he’s determined to avoid, pushing himself to do whatever it takes to stay with his team. Nothing prepares him to walk into the training center briefing and see the woman he’d cut from his life with a few brutal words. Nor does the sight of her do anything to stop the desire still burning within him. From the flash in her eyes, Dani hasn’t forgotten or forgiven his cruel words and ruthless behavior. Now Ghost has two goals. Stay on the team and win Dani back. If only her stubborn pride would crack enough to give him a fighting chance. As unexpected attacks target her father and the training center, she must shove aside her feelings for the enigmatic warrior. Will working for a common goal force them closer together or further divide the two, fiercely protective fighters? 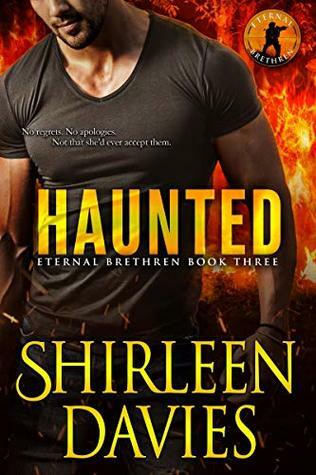 Haunted is book three in the Eternal Brethren Military Romantic Suspense Series by best seller Shirleen Davies. It is a stand-alone, full-length novel with no cliffhanger and a guaranteed HEA. To ask other readers questions about Haunted, please sign up. Shirleen Davies grew up in Southern California. She attended Oregon State University, and has degrees from San Diego State University and the University of Maryland. During the day she provides consulting services to small and mid-sized businesses. But her real passion is writing emotionally charged stories of flawed people who find redemption through love and acceptance. She now lives with her hu Shirleen Davies grew up in Southern California. She attended Oregon State University, and has degrees from San Diego State University and the University of Maryland. During the day she provides consulting services to small and mid-sized businesses. But her real passion is writing emotionally charged stories of flawed people who find redemption through love and acceptance. She now lives with her husband in a beautiful town in northern Arizona.